I hope you’re getting pretty used to these long intervals between posts. I always feel a bit guilty that I haven’t posted sooner, but as we know, things don’t always happen on a regular basis and those little creatures are not always so easy to find. I’ve found out quite a bit since the last time I posted and I also have a new section where I will be posting web page links to interesting sites I’ve found. Four more animals have made it in the list this week, two of them are firsts for me. A small mining bee called a Communal Mining Bee Andrena carantonica and a Bullfinch Pyrrhula pyrrhula which I spotted as I drove around a roundabout in Kent. Earlier in the week, I found myself delivering to a small place in Essex. The job was gonna take a couple of hours and a quick look at the OS map app showed me that I wasn't far from a footpath that meandered out into the countryside. So grabbing field bag, bins and phone I set off on a jaunt into the wilds of Essex to see what I could find. The footpath started as a little lane running off the main road. A sign on the entrance to the lane stated 'NO PARKING, PRIVATE DRIVE'. As I wasn't driving, I wasn't able to 'park' as such, so onward I proceeded down this pleasant little tarmac drive with high hedgerows on either side. Goldfinches flitted around me and it wasn't long before a pair of Siskin's sat in a tree singing away in front of me. I used to get a flock of about 16 of these birds to my garden niger feeder everyday about 3-4years ago. They used to empty the feeder on a daily basis and I used to refill it on that same daily basis. That was until one day when I had run out of seed and wasn't able to refill the feeder. The Siskin's came down, examined empty feeder and flew off never to be seen again, even though I refilled the feeder the next day. Fussy things. The footpath then meandered (I like that word) across a farmers field and into a small wooded area. All around me birds were singing the joys of spring and it was just so pleasant to be out and about enjoying it all. 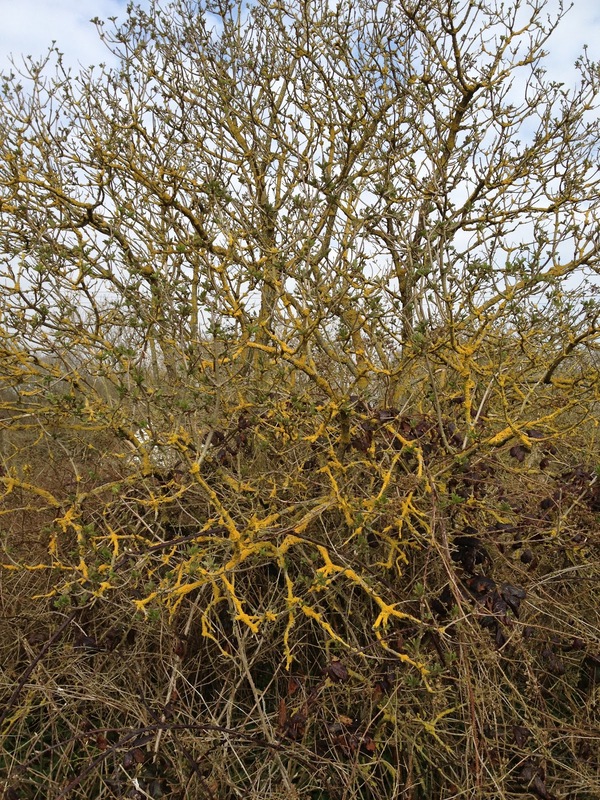 I then came across this lichen covered tree that looked really strange. Obviously, the lichen has found an excellent spot as it's doing so well and I'm never really sure as to include these to my list, because they're not exactly a plant. They're a joint venture of fungi and algae, which makes it quite hard as I've already recorded a fungi on the list, but I said from the start that I wasn't going to record plants or trees. Hmmm, so what do I do? As I forgot to take a sample of the lichen, I can't really give it a positive ID, so in this case it remains off the list. 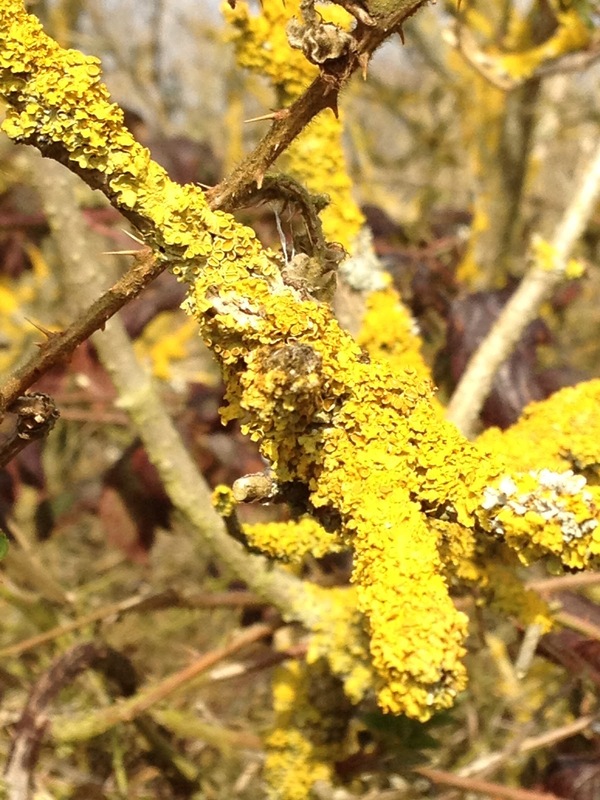 A closer look at the lichen. After about 50 mins, I decided to turn around and walk back. This is when I came across the communal mining bees buzzing around on the floor of the wood. I tried to get some pictures but eventually gave up and recorded some video! Ooh, look at me getting all technical and digital and down in the hood (or should that be wood). My main reason for this little jaunt other than just getting away from the truck and trying to find new species for the list was to try and nail (not literally) my first butterfly of the year. My friends on twitter have been banging away all week about how they've spotted 18 of this butterfly, 9 of that and 10 of the other, whilst I, stuck in the confines of my truck all day have spotted zilch! I wanted to rectify this and this was the perfect opportunity for me, and as I wandered back something small and brownish whizzed over my head and back down the path. 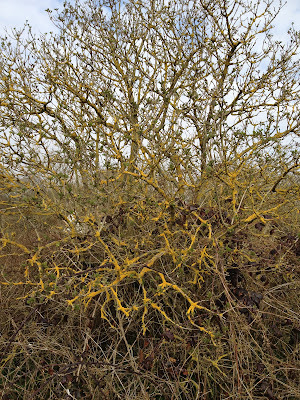 I turned around and saw it quickly divert into the hedgerow. 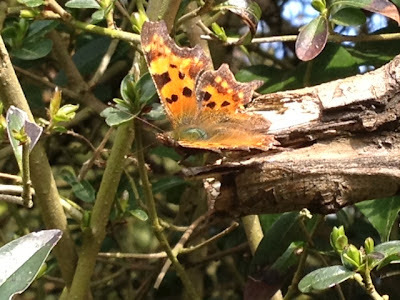 I ran, only 10 yds thankfully, back to see what it was and there in all its beauty was my first butterfly of the year, a Comma Polygonia c-album. So, first butterfly makes me well chuffed. I wish this photo did the beauty of this specimen justice, but alas, it doesn't. I use a pair of Pentax Papilo binoculars which are the best (I think) for looking at close in stuff such as butterflies, dragonflies etc and when you're looking at a butterfly that is only 2 foot from you through these bins, you really get to see all the intricate details of the hairs on the backs, the white legs and white tips on the antennae. I really recommend you put a pair of these on your wish list. I've won an award, apparently! Yes, can you believe it, me, an award. I got an email the other day saying that someone had commented on my Nacton Shores post. 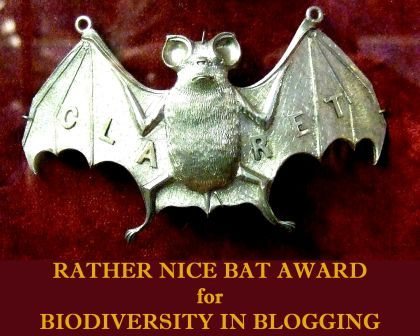 It was someone telling me that I won the Rather Nice Bat Award for Biodiversity in Blogging and was to celebrate me passing the 100 species mark. My acceptance speech can be seen by clicking on the link. which unfortunately, didn't come with the award. Useful places to visit on the web. The first and foremost site I can highly recommend for all you nature lovers out there is iSpot. If you find something that you don't really know what it is, take a photo of it, post it onto this website and usually within hours, if not minutes, someone will have ID'd it for you. You can then click on the links to see where else it's been recorded in the UK. Next, thanks to the Tweetersphere is UK Safari which is another way to ID your finds and is good if you like to try and ID it yourself rather than waiting for someone else to ID it for you.